Learn what your handwriting tell you about your personality and how you can change your personality by changing your handwriting. This book teaches you what your handwriting tells you about your personality and how you can change your personality by changing your handwriting! 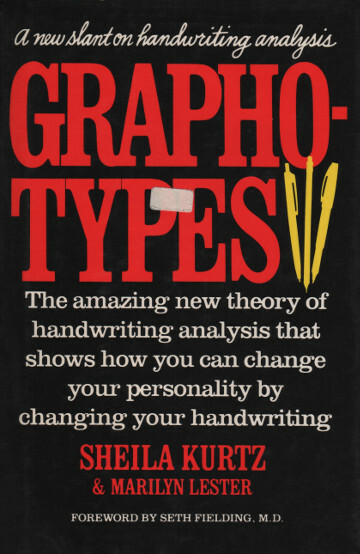 An amazing new theory of handwriting analysis, revealed for the first time in Graphotypes, will provide astonishing and extremely useful information about you and the people in your personal and business life. Handwriting analysis reveals more about personality than any other assessment method. Your handwriting is an extension of yourself, as much a part of you as any physical characteristic. You can even change your personality by changing your handwriting. The book has a hardback cover and is in a fairly good condition (for a book from 1985!). It has a little 'To Eloise' scribble on the first page, which you may want to analyse ;).